…well this is unexpected. I didn’t think this card would make it on the list, let alone be in the Top…6. Guess I’ll double-take on this and see what it can do. Professor Elm’s Lecture, aside from featuring one of my fave professors on it, is a Supporter that lets you add 3 Pokemon to your hand from your deck, as long as they have 60 HP or less. Then you can shuffle your deck. It’s times like this that I would love to have a database that sorts out Pokemon based on their HP scores in the TCG, cause it’s SO DIFFICULT TO JUST…wait, the Card Database does do that? You just gotta go Advanced Search? Oh…oh that makes this way easier then! The good thing about this is that most of the cards are evolving Basics, such as the ones featured in the artwork for this Supporter! You’re not gonna have to worry about your opponent bringing out the Lecture for Mewtwo-EX or Buzzwole-GX or anything like that – that HP score really keeps things in check! Some notable Pokemon you can grab with this, though, include things like Alolan Dugtrio, Eevee, and the little Wishiwashis! Throw in Expanded, and that includes things like Joltik of Night March fame! There are a few decks that get helped out by this card, so it’s definitely worth taking a look at. And just keep it in mind for all those times when you get a tiny Basic! Professor Elm’s Lecture (LOT 188) begins its tenure in the Pokemon Trading Card game from the Lost Thunder expansion set. This Supporter card allows you to search out three Pokemon from your deck that have sixty HP or less. It’s not Brigette, but it’s still pretty good. It’s given me a reason to put Lele back in some of my decks and going for the turn 1 Elm start. I’m playing it in my Lost March decks, Greninja, Vespiquen (LOT 32), Solgaleo GX Alolan Ninetales GX (LOT), Zoroark GX Weavile (UPR 74). I actually went up against an Alolan Dugtrio (UPR 79), and boy does Elm make that archetype a lot better! And yes this isn’t just for Basic Pokemon, it lets you grab ANY Pokemon with sixty HP or less. Ribombee SUM and LOT, Shedinja LOT, Skiploom LOT, and (as mentioned above) Alolan Dugtrio UPR all will benefit from the introduction of this card into the meta. You can even get Ditto Prism out too, so that gives you tremendous flexibility in Stage 1’s you can get into play… including the new Fairy Alolan Ninetales GX, which can in turn get you a couple Rare Candy so you can go get some Stage 2 Pokemon and accelerate their entry into the game. Professor Elm’s Lecture will function as a great springboard to get you off to a tremendous start in your match, and in today’s meta, getting a good start is essential for competing against the top decks in the format today. I did downgrade Elm a little after I started playing it and realizing exactly how many Basic Pokemon now have 70 (or more) HP. I had it as my number 1 card, but I think I would drop it down a couple of slots because there are a lot of archetypes that just won’t be able to use this card. Welcome to the second week of our Top 11 countdown. Yes, we normally do a Top 10 (more on that here), but this time we’re doing things a little differently. Sixth place goes to Professor Elm’s Lecture (SM – Lost Thunder 188/214, 213/214), a Trainer-Supporter that lets you search your deck for up to three Pokémon with 60 (or less) HP, then add them to your hand. While there have been two past Professor Elm-themed cards, the original Professor Elm (Neo Genesis 96/111; Best of Game 3) and Professor Elm’s Training Method (Expedition 148/165; EX – Unseen Forces 89/115; EX – Dragon Frontiers 79/101; HeartGold & SoulSilver 100/123; Call of Legends 82/95), the three don’t have a lot in common. In a sense, this is really a tweaked Brigette (XY – BREAKthrough 134/162, 131/162), herself a nerfed Pokémon Collector (HeartGold & SoulSilver 97/123). Pokémon Collector originally allowed you to grab any three Basic Pokémon from your deck and add them to your hand. Brigette tried to avoid the problems by giving you a choice of three Pokémon-EX or a single Pokémon-EX, plus she Benches them from the deck, bypassing certain hazardous effects but not triggering useful coming-into-play effects. While Pokémon Collector was an issue prior to Pokémon-EX, Brigette didn’t become a power play until the introduction of Pokémon-GX. It is possible, if not likely, that both cards were created with the intent of helping decks that needed to quickly Bench multiple Evolving Basics, but that is just an assumption. Professor Elm’s Lecture is even more suited to such a thing due to the HP cap, though it can actually grab any Stage, so long as its HP is below 60. Some Stage 1 Pokémon still have an abysmal 60 HP, and if you still play in the Unlimited Format, there are even a few Stage 2(!) Pokémon with 60 HP, including my beloved Dark Vilepume (Team Rocket 13/82, 30/82). Decks that Evolve several of the smaller Basic Pokémon now have a replacement for Brigette in the Standard Format. 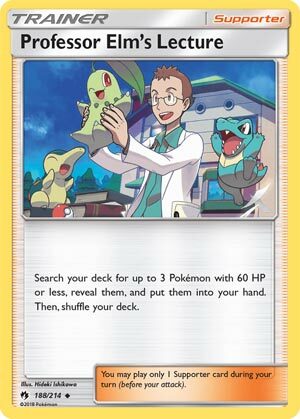 In Standard or Expanded, if the deck had a reason it needed those Pokémon in hand and/or include some of the smallest current Stage 1 Pokémon, Professor Elm’s Lecture is better than Brigette. UNLESS they are better served by running the sometimes slightly larger options for Evolving Basics. 70 HP has almost become the norm for a twice-Evolving Basic Pokémon, and is often needed in the light of bonus Bench hits and spread damage. I’ll skip Reviewer Otaku’s Lecture where I explain why it is a good thing that HP scores are rising, even if damage output goes up along with them but Especially if damage output does not. The Limited Format welcomes any additional search, given that you have to work with whatever cards are available at the event. I won’t be scoring it, but this card may have implications for the Unlimited Format. I mentioned Dark Vileplume earlier; I’ve no idea if it is still competitive in the Unlimited Format, or if I was even properly informed when I thought it was competitive, but its entire Evolution line can be fetched by Professor Elm’s Lecture. In a Format where Broken Time-Space is legal. While in play, Dark Vileplume prevents both players from playing Trainer cards from hand; pretty potent for a T1 lock! Professor Elm’s Lecture isn’t great, but I believe it will fill a need we’ve been feeling for a while. I’m usually not 100% certain about cards, and Professor Elm’s Lecture is no exception. I do worry that, between Brigette being the familiar choice in Expanded and many decks having already acclimated to Apricorn Maker and higher counts of “Ball” cards (or some other alternative), Professor Elm’s Lecture may be a little tardy. I was initially much more excited for the card, but now I think I ranked it too high on my personal countdown, thinking of it as “general” support when the HP restriction clearly means it isn’t.